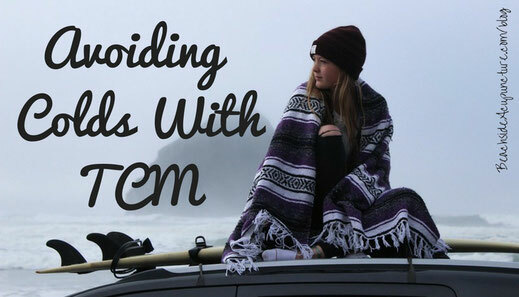 In TCM, the pathogens that cause colds especially like to attack the upper body, neck, and head, so wear a scarf, a thick jacket, and even a hat when you go outside, especially if it's windy and even if you don't think it's that cold. Keeping this area covered will also provide added benefits like decreasing allergy symptoms, neck stiffness, and upper back pain, as all of these issues can have a tie to the “wind” pathogen as well. If the weather is warming up where you live, think more in terms of blocking wind than keeping out cold and opt for light, airy scarves to keep your neck covered. Give your body the nutrients it needs to run at its best...but do so in a grounding seasonally appropriate way. Foods like watermelon and citrus are cooling and hydrating, which is why they're in season in summer. Winter produce like squash and potatoes are heartier and often need to be cooked anyway. Avoid tons of cold foods and opt for ones that make you feel warm inside and out. When a wind pathogen has recently entered the body – meaning you just woke up with a sore throat, have only been feeling achy for a few hours, or maybe don’t even have any symptoms yet! – TCM says the best way to get rid of it is to sweat it out. The wind pathogens that cause colds tend to get stuck on the exterior of our bodies, and opening the pores by making the body sweat releases them. While bundling up and eating warm foods will help with this, light exercise will guarantee that you’re perspiring…and give you a host of other health benefits as well. While not a principle of TCM because the ancient scholars didn’t have this issue, chemical fragrances are worth mentioning because they can have a significant impact on respiratory health. A British study found that the air inside homes could be more toxic than the air outside as people burned candles that contained synthetic chemicals that turned to formaldehyde, a known carcinogen. These chemicals irritate the respiratory system at any time of the year but can be worse in winter as the body's already taxed by changes in temperatures, dryness, etc. Decrease the amount of scented candles, plug-ins, and air fresheners you use in your home and replace them with fresh flowers, plants, and natural aromatics like essential oils. Not only will you be cutting your body’s toxic load but you’ll also provide it with the therapeutic benefits of natural products. Of course, once the weather warms up I highly recommend opening your windows and getting outside as well! With any luck, this cold and flu season will be over soon, but in the meantime start putting some of these suggestions into practice and have the peace of mind that you’re giving your body extra support with millennia-old health “secrets”.